1 C None No Power Seat 1 C is a standard Business Class seat located at the bulkhead. The close proximity to the lavatory and galley might be bothersome. 1 E None No Power Seat 1 E is a standard Business Class seat located at the bulkhead. The close proximity to the lavatory and galley might be bothersome. This seat is ideal if traveling with a companion. 1 F None No Power Seat 1 F is a standard Business Class seat located at the bulkhead. The close proximity to the lavatory and galley might be bothersome. This seat is ideal if traveling with a companion. 1 H None No Power Seat 1 H is a standard Business Class seat located at the bulkhead. The close proximity to the lavatory and galley might be bothersome. 10 A None No Power Seat 10 A is a standard Economy Class seat which offers extra legroom for an added fee. 10 C None No Power Seat 10 C is a standard Economy Class seat which offers extra legroom for an added fee. 10 D None No Power Seat 10 D is a standard Economy Class seat which offers extra legroom for an added fee. 10 E None No Power Seat 10 E is a standard Economy Class seat which offers extra legroom for an added fee. 10 F None No Power Seat 10 F is a standard Economy Class seat which offers extra legroom for an added fee. 10 G None No Power Seat 10 G is a standard Economy Class seat which offers extra legroom for an added fee. 10 H None No Power Seat 10 H is a standard Economy Class seat which offers extra legroom for an added fee. 10 K None No Power Seat 10 K is a standard Economy Class seat which offers extra legroom for an added fee. 11 A None No Power Seat 11 A is a standard Economy Class seat which offers extra legroom for an added fee. 11 C None No Power Seat 11 C is a standard Economy Class seat which offers extra legroom for an added fee. 11 D None No Power Seat 11 D is a standard Economy Class seat which offers extra legroom for an added fee. 11 E None No Power Seat 11 E is a standard Economy Class seat which offers extra legroom for an added fee. 11 F None No Power Seat 11 F is a standard Economy Class seat which offers extra legroom for an added fee. 11 G None No Power Seat 11 G is a standard Economy Class seat which offers extra legroom for an added fee. 11 H None No Power Seat 11 H is a standard Economy Class seat which offers extra legroom for an added fee. 11 K None No Power Seat 11 K is a standard Economy Class seat which offers extra legroom for an added fee. 12 A None No Power Seat 12 A is a standard Economy Class seat which offers extra legroom for an added fee. 12 C None No Power Seat 12 C is a standard Economy Class seat which offers extra legroom for an added fee. 12 D None No Power Seat 12 D is a standard Economy Class seat which offers extra legroom for an added fee. 12 E None No Power Seat 12 E is a standard Economy Class seat which offers extra legroom for an added fee. 12 F None No Power Seat 12 F is a standard Economy Class seat which offers extra legroom for an added fee. 12 G None No Power Seat 12 G is a standard Economy Class seat which offers extra legroom for an added fee. 12 H None No Power Seat 12 H is a standard Economy Class seat which offers extra legroom for an added fee. 12 K None No Power Seat 12 K is a standard Economy Class seat which offers extra legroom for an added fee. 13 A None No Power Seat 13 A is a standard Economy Class seat which offers extra legroom for an added fee. 13 C None No Power Seat 13 C is a standard Economy Class seat which offers extra legroom for an added fee. 13 D None No Power Seat 13 D is a standard Economy Class seat which offers extra legroom for an added fee. 13 E None No Power Seat 13 E is a standard Economy Class seat which offers extra legroom for an added fee. 13 F None No Power Seat 13 F is a standard Economy Class seat which offers extra legroom for an added fee. 13 G None No Power Seat 13 G is a standard Economy Class seat which offers extra legroom for an added fee. 13 H None No Power Seat 13 H is a standard Economy Class seat which offers extra legroom for an added fee. 13 K None No Power Seat 13 K is a standard Economy Class seat which offers extra legroom for an added fee. 14 A None No Power Seat 14 A is a standard Economy Class seat which offers extra legroom for an added fee. 14 C None No Power Seat 14 C is a standard Economy Class seat which offers extra legroom for an added fee. 14 D None No Power Seat 14 D is a standard Economy Class seat which offers extra legroom for an added fee. 14 E None No Power Seat 14 E is a standard Economy Class seat which offers extra legroom for an added fee. 14 F None No Power Seat 14 F is a standard Economy Class seat which offers extra legroom for an added fee. 14 G None No Power Seat 14 G is a standard Economy Class seat which offers extra legroom for an added fee. 14 H None No Power Seat 14 H is a standard Economy Class seat which offers extra legroom for an added fee. 14 K None No Power Seat 14 K is a standard Economy Class seat which offers extra legroom for an added fee. 15 A None No Power Seat 15 A is a standard Economy Class seat which offers extra legroom for an added fee. 15 C None No Power Seat 15 C is a standard Economy Class seat which offers extra legroom for an added fee. 15 D None No Power Seat 15 D is a standard Economy Class seat which offers extra legroom for an added fee. 15 E None No Power Seat 15 E is a standard Economy Class seat which offers extra legroom for an added fee. 15 F None No Power Seat 15 F is a standard Economy Class seat which offers extra legroom for an added fee. 15 G None No Power Seat 15 G is a standard Economy Class seat which offers extra legroom for an added fee. 15 H None No Power Seat 15 H is a standard Economy Class seat which offers extra legroom for an added fee. 15 K None No Power Seat 15 K is a standard Economy Class seat which offers extra legroom for an added fee. 16 A None No Power Seat 16 A is a standard Economy Class seat which offers extra legroom for an added fee. 16 C None No Power Seat 16 C is a standard Economy Class seat which offers extra legroom for an added fee. 16 D None No Power Seat 16 D is a standard Economy Class seat which offers extra legroom for an added fee. 16 E None No Power Seat 16 E is a standard Economy Class seat which offers extra legroom for an added fee. 16 F None No Power Seat 16 F is a standard Economy Class seat which offers extra legroom for an added fee. 16 G None No Power Seat 16 G is a standard Economy Class seat which offers extra legroom for an added fee. 16 H None No Power Seat 16 H is a standard Economy Class seat which offers extra legroom for an added fee. 16 K None No Power Seat 16 K is a standard Economy Class seat which offers extra legroom for an added fee. 17 A None No Power Seat 17 A is a standard Economy Class seat which offers extra legroom for an added fee. 17 C None No Power Seat 17 C is a standard Economy Class seat which offers extra legroom for an added fee. 17 D None No Power Seat 17 D is a standard Economy Class seat which offers extra legroom for an added fee. 17 E None No Power Seat 17 E is a standard Economy Class seat which offers extra legroom for an added fee. 17 F None No Power Seat 17 F is a standard Economy Class seat which offers extra legroom for an added fee. 17 G None No Power Seat 17 G is a standard Economy Class seat which offers extra legroom for an added fee. 17 H None No Power Seat 17 H is a standard Economy Class seat which offers extra legroom for an added fee. 17 K None No Power Seat 17 K is a standard Economy Class seat which offers extra legroom for an added fee. 18 A None No Power Seat 18 A is a standard Economy Class seat which offers extra legroom for an added fee. 18 C None No Power Seat 18 C is a standard Economy Class seat which offers extra legroom for an added fee. 18 D None No Power Seat 18 D is a standard Economy Class seat which offers extra legroom for an added fee. 18 E None No Power Seat 18 E is a standard Economy Class seat which offers extra legroom for an added fee. 18 F None No Power Seat 18 F is a standard Economy Class seat which offers extra legroom for an added fee. 18 G None No Power Seat 18 G is a standard Economy Class seat which offers extra legroom for an added fee. 18 H None No Power Seat 18 H is a standard Economy Class seat which offers extra legroom for an added fee. 18 K None No Power Seat 18 K is a standard Economy Class seat which offers extra legroom for an added fee. 23 A None No Power Seat 23 A is a standard Economy Class seat in the last row of this cabin. This seat might have limited recline. The proximity to the lavatory area might be bothersome. 23 C None No Power Seat 23 C is a standard Economy Class seat in the last row of this cabin. This seat might have limited recline. The proximity to the lavatory area might be bothersome. 23 D None No Power Seat 23 D is a standard Economy Class seat in the last row of this cabin. This seat might have limited recline. The proximity to the lavatory area might be bothersome. 23 E None No Power Seat 23 E is a standard Economy Class seat in the last row of this cabin. This seat might have limited recline. The proximity to the lavatory area might be bothersome. 23 F None No Power Seat 23 F is a standard Economy Class seat in the last row of this cabin. This seat might have limited recline. The proximity to the lavatory area might be bothersome. 23 G None No Power Seat 23 G is a standard Economy Class seat in the last row of this cabin. This seat might have limited recline. The proximity to the lavatory area might be bothersome. 23 H None No Power Seat 23 H is a standard Economy Class seat in the last row of this cabin. This seat might have limited recline. The proximity to the lavatory area might be bothersome. 23 K None No Power Seat 23 K is a standard Economy Class seat in the last row of this cabin. This seat might have limited recline. The proximity to the lavatory area might be bothersome. 24 A None No Power Seat 24 A is a standard Economy Class seat that features added leg room due to its exit row location. The tray table and IFE monitor are in the armrest making the armrest immovable and slightly reducing seat width. This seat does not have floor storage during take off and landing. 24 C None No Power Seat 24 C is a standard Economy Class seat that features added leg room due to its exit row location. The tray table and IFE monitor are in the armrest making the armrest immovable and slightly reducing seat width. This seat does not have floor storage during take off and landing. 24 D None No Power Seat 24 D is a standard Economy Class seat that features added leg room due to its exit row location. The tray table and IFE monitor are in the armrest making the armrest immovable and slightly reducing seat width. This seat does not have floor storage during take off and landing. 24 E None No Power Seat 24 E is a standard Economy Class seat that features added leg room due to its exit row location. The tray table and IFE monitor are in the armrest making the armrest immovable and slightly reducing seat width. This seat does not have floor storage during take off and landing. 24 F None No Power Seat 24 F is a standard Economy Class seat that features added leg room due to its exit row location. The tray table and IFE monitor are in the armrest making the armrest immovable and slightly reducing seat width. This seat does not have floor storage during take off and landing. 24 G None No Power Seat 24 G is a standard Economy Class seat that features added leg room due to its exit row location. The tray table and IFE monitor are in the armrest making the armrest immovable and slightly reducing seat width. This seat does not have floor storage during take off and landing. 24 H None No Power Seat 24 H is a standard Economy Class seat that features added leg room due to its exit row location. The tray table and IFE monitor are in the armrest making the armrest immovable and slightly reducing seat width. This seat does not have floor storage during take off and landing. 24 K None No Power Seat 24 K is a standard Economy Class seat that features added leg room due to its exit row location. The tray table and IFE monitor are in the armrest making the armrest immovable and slightly reducing seat width. This seat does not have floor storage during take off and landing. 3 E None No Power Seat 3 E is a standard Business Class seat. This seat is ideal if traveling with a companion. 3 F None No Power Seat 3 F is a standard Business Class seat. This seat is ideal if traveling with a companion. 33 G None No Power Seat 33 G is a standard Economy Class seat. This seat might often be bumped by service carts and passengers passing from the back of the aircraft. 37 A None No Power Seat 37 A is a standard Economy Class seat located in the last row of the aircraft and might have limited recline. 37 C None No Power Seat 37 C is a standard Economy Class seat located in the last row of the aircraft and might have limited recline. 37 H None No Power Seat 37 H is a standard Economy Class seat located in the last row of the aircraft and might have limited recline. 37 K None No Power Seat 37 K is a standard Economy Class seat located in the last row of the aircraft and might have limited recline. 38 D None No Power Seat 38 D is a standard Economy Class seat located in the last row of the aircraft and might have limited recline. 38 F None No Power Seat 38 F is a standard Economy Class seat located in the last row of the aircraft and might have limited recline. 38 G None No Power Seat 38 G is a standard Economy Class seat located in the last row of the aircraft and might have limited recline. 5 C None No Power Seat 5 C is a standard Business Class seat. The proximity to the lavatory and the galley might be bothersome. 5 E None No Power Seat 5 E is a standard Business Class seat. The proximity to the lavatory and the galley might be bothersome. This seat is ideal if traveling with a companion. 5 F None No Power Seat 5 F is a standard Business Class seat. This seat is ideal if traveling with a companion. The proximity to the lavatory and the galley might be bothersome. 5 H None No Power Seat 5 H is a standard Business Class seat. The proximity to the lavatory and the galley might be bothersome. 6 D None No Power Seat 6 D is a standard Economy Class seat which offers extra legroom for an added fee. The bulkhead, the proximity to the lavatory, and the galley might be bothersome. The tray table and the IFE monitor are in the armrest making the armrests immovable and slightly reducing seat width. This seat does not have floor storage during take off and landing. 6 E None No Power Seat 6 E is a standard Economy Class seat which offers extra legroom for an added fee. The bulkhead, the proximity to the lavatory, and the galley might be bothersome. The tray table and the IFE monitor are in the armrest making the armrests immovable and slightly reducing seat width. This seat does not have floor storage during take off and landing. 6 F None No Power Seat 6 F is a standard Economy Class seat which offers extra legroom for an added fee. The bulkhead, the proximity to the lavatory, and the galley might be bothersome. The tray table and the IFE monitor are in the armrest making the armrests immovable and slightly reducing seat width. This seat does not have floor storage during take off and landing. 6 G None No Power Seat 6 G is a standard Economy Class seat which offers extra legroom for an added fee. The bulkhead, the proximity to the lavatory, and the galley might be bothersome. The tray table and the IFE monitor are in the armrest making the armrests immovable and slightly reducing seat width. This seat does not have floor storage during take off and landing. 7 A None No Power Seat 7 A is a standard Economy Class seat which offers extra legroom for an added fee. The proximity to the bulkhead, the lavatory, and the galley might be bothersome. The tray table and the IFE monitor are in the armrest making the armrests immovable and slightly reducing seat width. This seat does not have floor storage during take off and landing. 7 C None No Power Seat 7 C is a standard Economy Class seat which offers extra legroom for an added fee. The proximity to the bulkhead, the lavatory, and the galley might be bothersome. The tray table and the IFE monitor are in the armrest making the armrests immovable and slightly reducing seat width. This seat does not have floor storage during take off and landing. 7 D None No Power Seat 7 D is a standard Economy Class seat which offers extra legroom for an added fee. 7 E None No Power Seat 7 E is a standard Economy Class seat which offers extra legroom for an added fee. 7 F None No Power Seat 7 F is a standard Economy Class seat which offers extra legroom for an added fee. 7 G None No Power Seat 7 G is a standard Economy Class seat which offers extra legroom for an added fee. 7 H None No Power Seat 7 H is a standard Economy Class seat which offers extra legroom for an added fee. The proximity to the bulkhead, the lavatory, and the galley might be bothersome. The tray table and the IFE monitor are in the armrest making the armrests immovable and slightly reducing seat width. This seat does not have floor storage during take off and landing. 7 K None No Power Seat 7 K is a standard Economy Class seat which offers extra legroom for an added fee. The proximity to the bulkhead, the lavatory, and the galley might be bothersome. The tray table and the IFE monitor are in the armrest making the armrests immovable and slightly reducing seat width. This seat does not have floor storage during take off and landing. 8 A None No Power Seat 8 A is a standard Economy Class seat which offers extra legroom for an added fee. 8 C None No Power Seat 8 C is a standard Economy Class seat which offers extra legroom for an added fee. 8 D None No Power Seat 8 D is a standard Economy Class seat which offers extra legroom for an added fee. 8 E None No Power Seat 8 E is a standard Economy Class seat which offers extra legroom for an added fee. 8 F None No Power Seat 8 F is a standard Economy Class seat which offers extra legroom for an added fee. 8 G None No Power Seat 8 G is a standard Economy Class seat which offers extra legroom for an added fee. 8 H None No Power Seat 8 H is a standard Economy Class seat which offers extra legroom for an added fee. 8 K None No Power Seat 8 K is a standard Economy Class seat which offers extra legroom for an added fee. 9 A None No Power Seat 9 A is a standard Economy Class seat which offers extra legroom for an added fee. 9 C None No Power Seat 9 C is a standard Economy Class seat which offers extra legroom for an added fee. 9 D None No Power Seat 9 D is a standard Economy Class seat which offers extra legroom for an added fee. 9 E None No Power Seat 9 E is a standard Economy Class seat which offers extra legroom for an added fee. 9 F None No Power Seat 9 F is a standard Economy Class seat which offers extra legroom for an added fee. 9 G None No Power Seat 9 G is a standard Economy Class seat which offers extra legroom for an added fee. 9 H None No Power Seat 9 H is a standard Economy Class seat which offers extra legroom for an added fee. 9 K None No Power Seat 9 K is a standard Economy Class seat which offers extra legroom for an added fee. Azul provides complimentary beverages and a large assortment of snacks. Full meal service is provided on A330 aircraft on international filights to/from South America. Azul flies their Airbus A330-200 primarily on long-haul routes. Service aboard features two classes - Azul Xtra Business Class and Economy. Economy Xtra is available which provides the passenger with added legroom for an extra fee. All seating features leather seats, individual inflight monitors, and power ports. Azul was the first airline in Latin America to feature inflight entertainment monitors at every seat on all of its jets. A flat bed. Good service. Although terribly bad because boarding and disembarkation were both by BUS. Even though paying Business, all passengers are shoved in 2 buses, almost falling over other people. This is a regular economy seat but this plane has extremely tight and narrow seats. Very uncomfortable. The Business Class was a really good surprise. Excellent service. This is the "hell spot" in the aircraft. Fly this seat only if you want to pay for all your sins... The seat reclines very little and is located by the door of two lavatories!!! Flying business class from Orlando to Viracopos was amazing. It was comfortable and spacious. Nothing was disappointing during the flight. The food was great also. The lie-flat bed was a plus. It was very easy to sleep. Also, the flight attendants were extremely nice and had really good manners. They're not like any other flight attendants I have flown with. If you ever get the opportunity to fly business with Azul, don't pass up the opportunity. You'll really enjoy it! 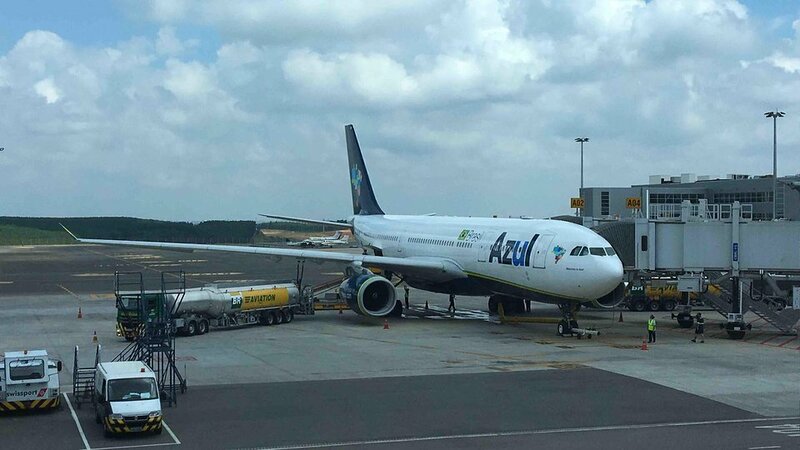 Azul flies 1 versions of Airbus A330-200.